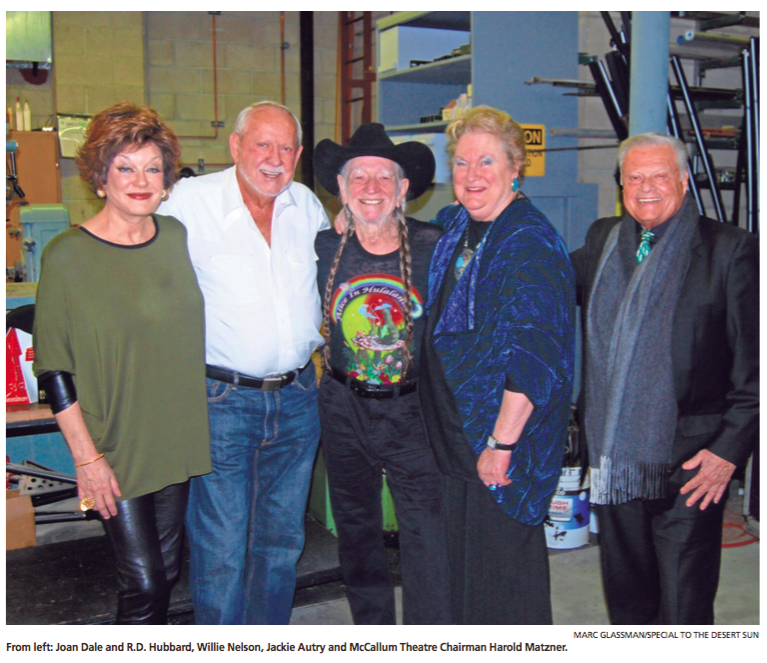 The sold-out-with-a-waiting list crowd that filled the McCallum Theatre for last week’s Willie Nelson concert knew exactly what they wanted: The same thing that iconic philanthropists Jackie Autry and R.D. Hubbard wanted … to hear Willie Nelson sing — no more, no less. Both Autry and Hubbard have given millions of dollars to Eisenhower Medical Center, just one of the many nonprofits that they support. Both are big fans of western art and culture and have known Nelson for many years. When it got close to the 8 p.m. curtain time and Willie wasn’t backstage, both Jackie and R.D. headed to Willie’s bus to remind him about the starting time. The three have been good friends for many years. Another Hubbard and Autry friend, philanthropist and McCallum Board Chairman Harold Matzner, fully underwrote the performance. He looked good. For age 82, he looked great! He stood straight and trim, shoulders back, his long, blonde braids hanging below his waist. His singing slid seamlessly from one famous hit into another, accompanied by a drummer and an electric harmonica. A few songs later, they were joined by a superb pianist, Bobbie Nelson, whom Willie referred to as “my little sister,” and a fifth versatile musician playing a variety of instruments. From “Good Hearted Woman” to “Don’t Let Your Babies Grow Up to be Cowboys” Nelson just stood there singing. He never sat down, changed clothes nor left the stage. He sang, non-stop for 90 minutes. The audience was mesmerized and, except for bursts of applause, you could hear a pin drop. Several of the arrangements allowed Nelson to show off his superb skills as a guitarist, generating additional cheers. Little sister Bobbie also showcased the family talent with a rousing piano solo. At one point, Nelson removed his black Stetson and exchanged it for his familiar red print bandana headband. Then he unexpectedly tossed the headband into the second row of the audience where it was caught and triumphantly waved by a joyous young man. Three more bandanas were tossed as the show progressed. There was only one exception to the program of Willie Nelson singing his hits. Near the end of the show he introduced a number from his latest CD — “Alexander’s Ragtime Band” which showed off the clear intensity of his voice. He’s still got it. The show closed in the same simple, direct, no-nonsense way it opened. After “Roll Me Up” and “I Saw The Light” Nelson stepped forward to shake some front-row hands and blow kisses to the audience. With that, he left the stage with the same stealth as he entered. The curtain dropped. The show was over — right on time. Virtually every member of the audience was beaming as they left the McCallum. They loved Willie.